As I walked up to the school campus for my daughters kindergarten assessment, I was lost. I knew where the office was. But where in the world was room 17? I felt somewhat lost as I stumbled around campus with my two kids until I came across a plethora of other parents and their kids waiting in front of room 17. What I felt was a mix between intimidation and embarrassment as I didn’t know where to go. I had never stepped foot on this elementary school campus before. I had never taken a kid to a kindergarten assessment before, which caused another layer of angst (I didn’t want to make her late for her first interaction with her teacher). Going somewhere new can be extremely intimidating. It is even more intimidating if you are stepping out of your comfort zone and you are alone. Signs are what tell people where they need to go. Now imagine the visitor stepping onto your church campus for the first time. This may be the first time they have stepped on any church campus. They are intimidated by their new surroundings. They scope out what people are wearing from their car to make sure they will fit in. What will they experience when they step outside of their car? Will they know where to go? Will there be signs to guide them? Will they feel out of place and not a part of the club? Our goal as a Church should be to provide an environment that is welcoming for all, and this includes having the appropriate signs up so those who are new to your church campus know where to go. The signs should be clear and concise, providing the information your guest needs to make it to the worship service. This becomes even more imperative if you have multiple venues. The signs on your campus should show your guest exactly where to go. 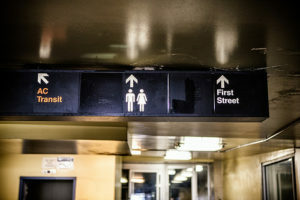 Your signs should show where the bathrooms are located, various venues, and most important for a family visiting, where your children’s ministry program takes place. Everything on your campus communicates something. As you plan for your weekly worship service, consider what your campus is saying to those stepping on your church campus for the first time this coming Sunday. In the book Fusion, Searcy and Henson state that first time guests will decide in the first seven minutes of contact with your church if they are coming back. You have seven minutes to make a positive first impression. How many of those seven minutes will be spent trying to find where to take their child or where the worship service takes place? The decision to return or not to return may not be based on sound logic, but it is based on their initial experience with your church. What are you communicating to first time guests? How are you reaching them within their first seven minutes?